326 pages | 36 B/W Illus. The current literature on central banking contains two distinct branches. On the one side, research focuses on the impact of monetary policy on economic growth, unemployment, and output-price inflation, while ignoring financial aspects. On the other side, some scholars leave aside macroeconomics in order to study the narrow, but crucial, subjects of financial behaviours, and financial supervision and regulation. This book aims at merging both approaches by using macroeconomic analysis to show that financial considerations should be the main preoccupation of central banks. Eric Tymoigne shows how different views regarding the conception of asset pricing lead to different positions regarding the appropriate role of a central bank in the economy. In addition, Hyman P. Minsky’s framework of analysis is used extensively and is combined with other elements of the Post Keynesian framework to study the role of a central bank. 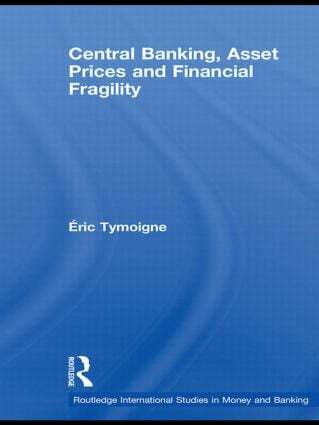 Tymoigne argues that central banks should be included in a broad policy strategy that aims at achieving stable full employment. Their sole goal should be to promote financial stability, which is the best way they can contribute to price stability and full employment. Central banks should stop moving their policy rate frequently and widely because that creates inflation, speculation, and economic instability. Instead, Tymoigne considers a pro-active financial policy that does not allow financial innovations to enter the economy until they are certified to be safe and that focuses on analyzing systemic risk. He argues that central banks should be a guide and a reformer that allow a smooth financing and funding of asset positions, while making sure that financial fragility does not increase drastically over a period of expansion. This book will be of interest to students and researchers engaged with central banking, macroeconomics, asset pricing and monetary economics. Eric Tymoigne is Assistant Professor of Economics at California State University Fresno. This series explores the roles of money and banking in the modern world. Banking is an increasingly important and international industry, and its interaction with money is a major concern for the world's economic policy-makers.